After a hard few years bashing around more hazardous places such as India, Chernobyl and Tunisia a decision was taken to keep it simple and have a plod around Europe and a play on a few of the better roads it has to offer. We had looked at the Crimea but the Euro championship were on at the same time. This had caused a problem in accommodation being found. A decision was made to wing it through Europe. The only place cased in stone was a visit to the Scarpa boot factory in Asolo Italy. A long run south and then 32 hours on a ferry, 2 nights a chance to recharge talk about what is to come and prepares us for an early start at Bilbao. An easy run set off in good time and it stayed dry. The highlight of the day was arriving with enough time to visit the indian restaurant close to the port rather than face ferry food for 2 nights. Excellent decision fine food and the a ferry delay made it all worthwhile. The blank day on Monday would be wasted talking about where and when and the weather, the weather it was felt would play a big part in the enjoyment of this trip and the excellent roads it has to offer. what a dining room at the hotel Casa Cayo ...help yourself ?? An early morning departure from the boat (7.30 local time) and head west to the Pico's De Europe national park and after a loop around the whole park including a couple of excursions to the Cores Gorge and to the cable car station at Fente De we would find a bed in Potes at the Casa Cayo hotel. A wonderful spot visited by myself on several previous excursions. The next highlight would be watching England qualify leaders of the group in the Euro 2012 championship. A late start from Potes as I don't want to leave. The road out of the Pico's in nice twisty with excellent views. After that it was motorway and after Bilbao it became expensive motorway. It was nice to reach 200 miles and turn off and head for St Jean P Du Port. It was busy here and the first 2 hotels were full. The one we ended up in was very poor to say the least. That night it went from being hot and sunny 32c to torrential Rain and lightening. A good day and an early start to beat the heat. The pace was very slow as we had 7 passes to cross along the Pyrenees before ending up back in Spain. Most of the Cols are used in the Tour De France and as such were very busy with cyclists. Today's run although less than 200 miles was very tiring, I don't think we had more than a mile of straight road all day, bikers paradise. The weather was kind today with only a bit wind on the tops to contend with. Vielha looked quiet with most of the trade in the winter. 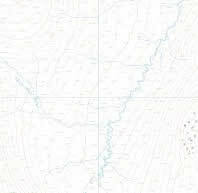 A decision to cut out the passes to Andorra and make directly for Orange using mainly the peage. 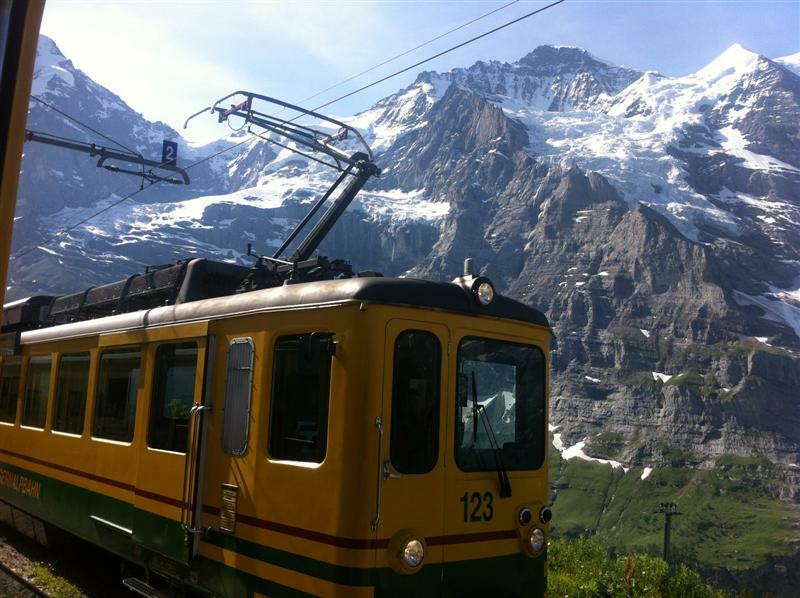 This would allow us to reach Lauterbrunnen on time. It just was not possible to do it all. The first 30 miles was great but once you hit the peage it gets boring and the only thing that changed was the temperature, from leaving the hotel at 13c it quickly rose by lunchtime to 33c. The an accident took the speed down to walking pace until we used the hard shoulder. Just as well as the jam lasted 9 miles until we seen the remains of a burned out bus, only the frame remained, what a mess. An excellent day, on leaving Orange and doing a few miles heading for Briancon and taking 2 days to reach Lauterbrunnen, I had a change of mind. 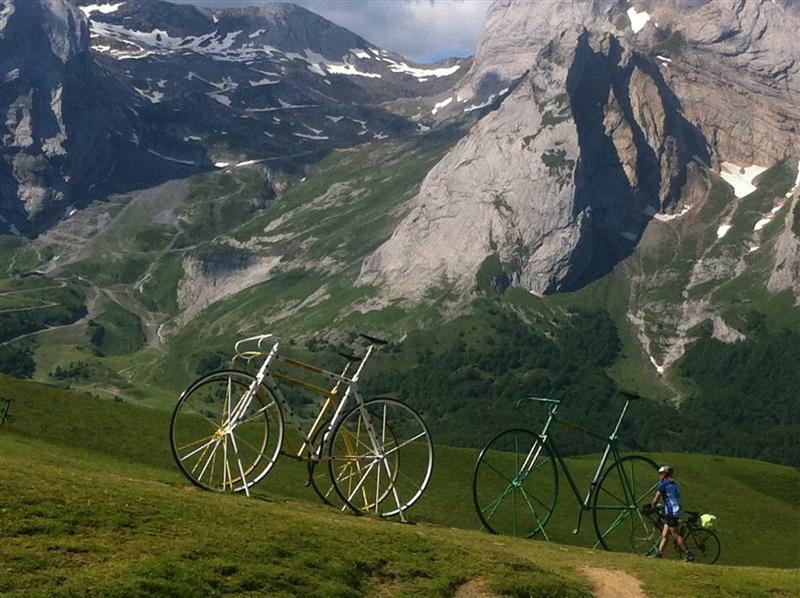 Why not turn around kill the miles on the peage and reach Lauterbrunnen in one day. Why, well a train in the Swiss alps (Jungfrau region) takes you too the top of the Jungfrauroch at 11333 foot and Neil had never had this experience before. 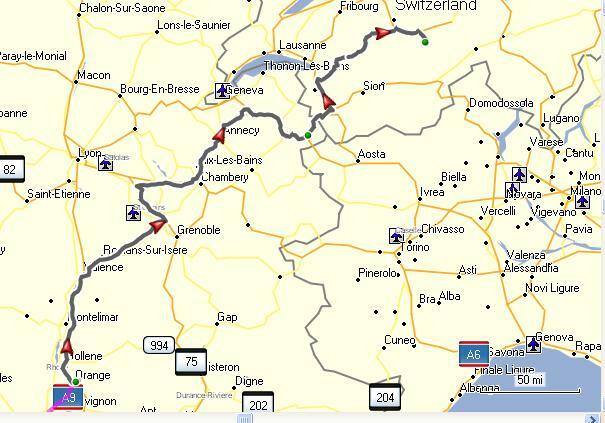 We had checked the weather and Sunday would be nice and Monday rain.The journey is billed as the "Top of Europe". In effect we would be reaching Lauterbrunnen 2 days ahead of our original plan, one day to do the train and another to take more time reaching Asolo. 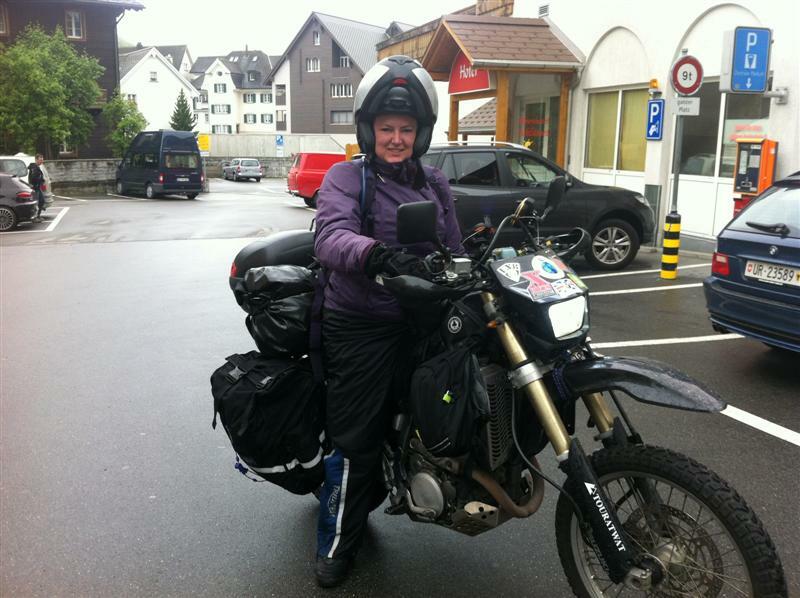 The ride worked out well peage to Annecy then head for Chamonix Mont Blanc and off the peage and enjoy the run to Matingny, then join Swiss motorway briefly before heading across country to Interlaken and onto Lauterbrunnen.This was not in the planning. However the GPS took us over wonderful Swiss countryside a pass or two before rejoining the main road 70 miles later into Interlaken. The road was very busy hundreds of bikes and a classic car run was heading in the opposite direction. Testament to the quality of this route. Lauterbrunnen was reached about 6pm and another hour would be spent looking for hotels which on this nice weekend were busy, An earlier acquaintance in town Regula who runs a lovely watch and knife shop was on hand to help. 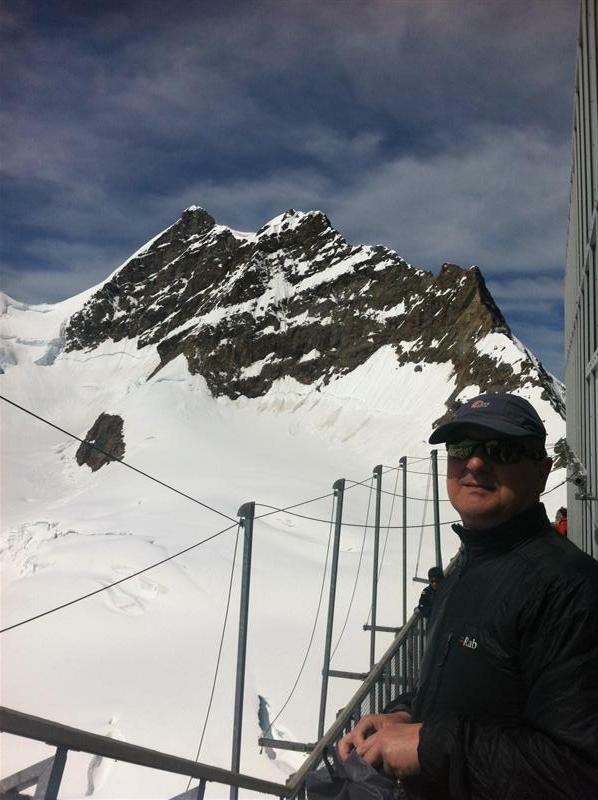 Sunday rest day was used to visit Jungfrauroch by train and the highest railway station in Europe at 11333 ft (3454m). The weather was excellent allowing for world beating views of the mountains and valleys below. Recession has not hit this railway experience yet and in 2011 it boasts 760,000 visitors. A late start to allow it to clear, which in a way worked a little and allowed the journey to take us the Sustern pass and a stop off at Andermatt where we met a girl Fran in her 20s from Cambridge doing a solo trip to Australia alone. she was well planned and spending 8 months to accomplish her mission. It was the onto Chur for this part of the journey from Lauterbrunnen was good mountain roads. 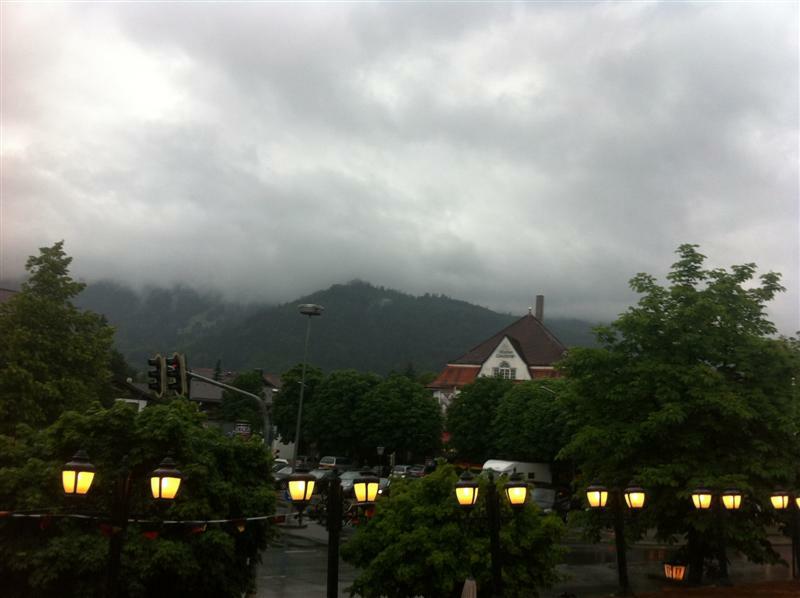 Chur is an ugly looking place on the outside where it started to rain which would then continue solid for next 2 hours or more before we reached tonight's bed at St Anton. The road from Chur was mainly motorway apart from the run into St Anton which I guess would have been excellent had we been able to see more the 50 or so meters into the rain and mist. It was 7pm before we finally killed the engines and started the process of hanging out wet over suits to dry. Luckily the water penetration to skin was my hands.The owner was kind and we parked the bikes in his garage. St Anton was super quiet as it usually is this time of year. I caught Neil asking for the bill from the restaurant at 10pm, was he tired? or wanting to let the staff go home early? Not a chance as I asked for one more beer. Timmelsjoch pass, and time for heated grips, it would rise to 28c very quickly. Well it looked damp at breakfast but was dry by the time I wasted an hour eating it. The Guest house accommodation had been excellent. Bacon and eggs if you wanted the first in a week all for 35euros . Off we went using non motorway to reach the start of day proper which would take us over the Timmelsjoch pass over 2500 meters up. The road was fantastic and I had previously done this in the opposite direction and cant remember having to pay €12 each for the privilege. Any way it is nice and the top is also the border between Austria and Italy. It was then a left turn from the foot of the pass and up and over Jaufenpass a small one at 2100m before heading for an early finish at Bressanone,Italy for an early night. 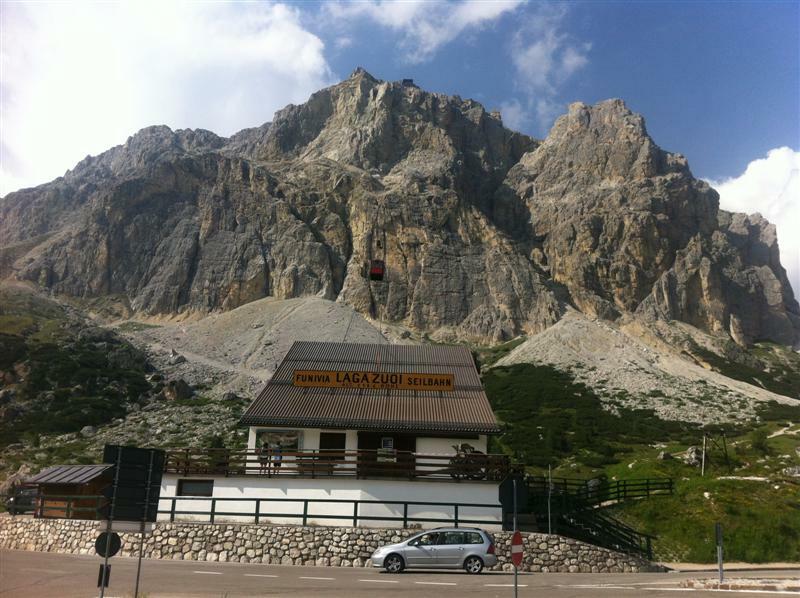 The temperature had now rising from 10c on the top of the pass to 29c in the town. The town of Bressanone is also known as Brixan which is its German name as this part of Italy is in the German speaking sector. It said closed, but we went on and guess what!! After a late start due to a walk about around the old town and even a church visit we set off at 10.30 for what was planned as an easy 126 miles into Asolo we were in a shock. Slow going over the passes was made worse when the second one of the day was closed and were turned back this would add 20 miles and an hour to the journey. Then came a cycle race to navigate to slow us down before hitting the town of Asolo and finding a bed would add a further hour to the day. All in all it was after 5m before we unloaded the bike from the public car park that threatened to tow the vehicles away if the correct ticket was not displayed. The town very small and historical only has 4 hotels with one off these being 2 miles out are all expensive and on this occasion three out of four were full. The town also has no taxis. 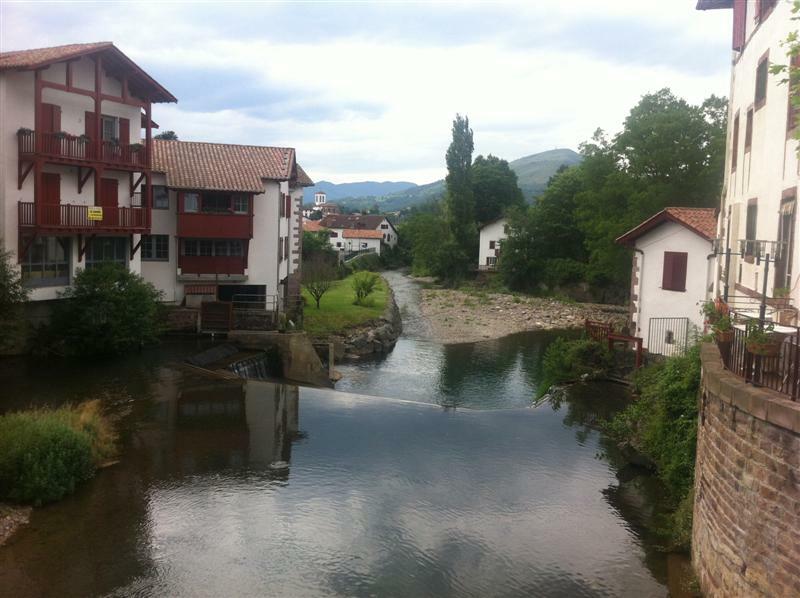 The town and its narrow streets made navigation difficult and the town is a lot smaller than I had imagined. 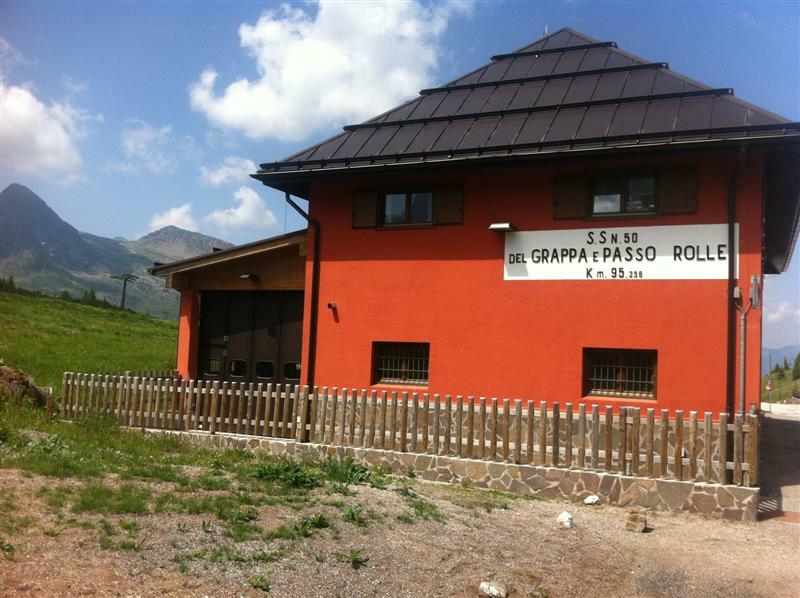 Anyway rest day tomorrow and a visit to Scarpa factory at 10am is our main focus. The tour of the factory was fantastic and very interesting and we were amazed at how much work and skill goes into the production of a pair of shoes or boots. The added bonus was that Sandro the CEO was our guide, also amazing was that his father at the age of 85 was still on the factory floor. It was then off to the European headquarters of Alpinestars to see the development of new products and the testing off all aspects of design and manufacture. We even managed to squash in a visit to their production of one off tailor made suits for all the racing stars that use their products. Attention to detail was unbelievable even down to moulds of their feet producing individual lasts. As we were transported to lunch the temperature was 37c. So pleased it was a rest from the bike suit today.The evening would be spent in the village square watching Italy play Germany in the semi finals of Euro 2012. A long day in the seat for what should have been an easy day. But what wonderful miles . Not sure but I think we went over 7 passes all about 2000m or higher. 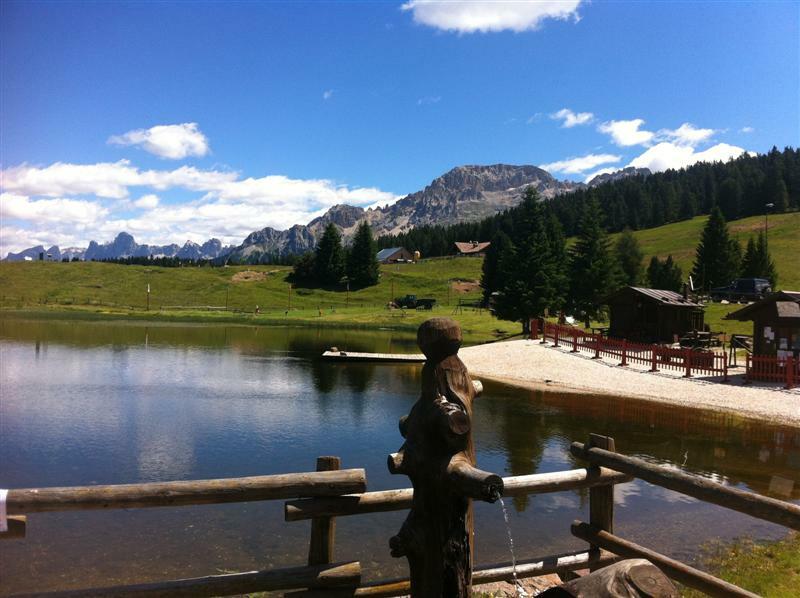 This being my first trip to the Dolomites and I was keen to see what it had to offer. I was not disappointed. The first hotel we choose was the on we stopped at and what a choice. 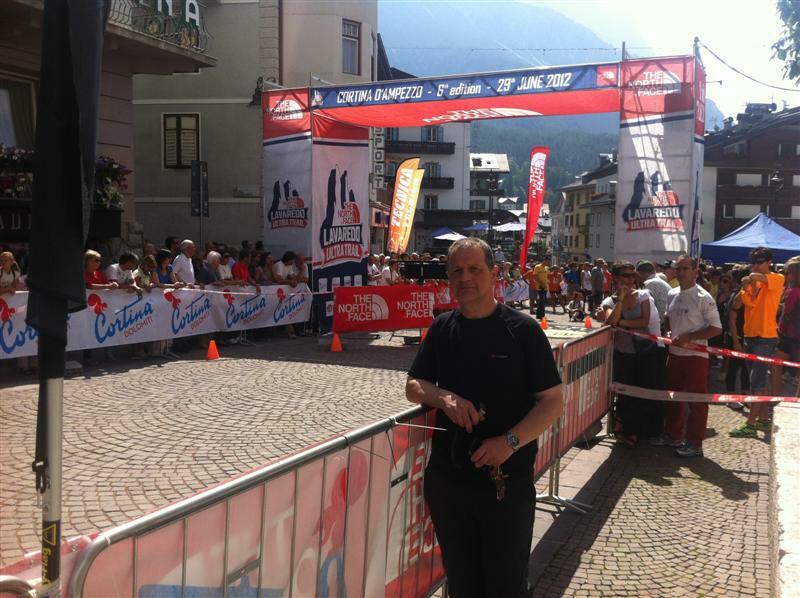 Then off to the town where we found the town very busy as a race was to start at 10pm, a 120km hill race which included 20,000 of accent, sadly my fell running shoes where back at home. around 600 people started this grueling course, unbelievable . On the way to Mayrhofen we passes a waterfall, terrible photo being the 5th highest in the world, 57000litres of water per second in the summer, only 350 liters in the winter. After a good night watching the start of the race we decided to call back into town to watch the finish and the start of the smaller 50km mountain race at 9am. The 50 km race had a lot more takers and the town was a bit of a buzz on a lovely summers day. This place is fantastic the mountain views in all directions whereas I say Chamonix is the Keswick of France only bigger then this is the Keswick of Italy. 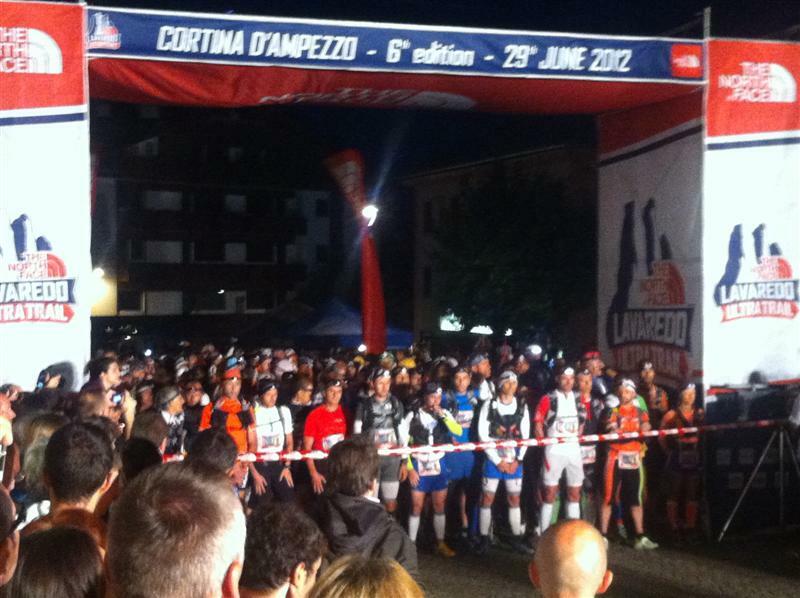 At just before 10.30am the winner of the ultimate 120km race came in he looked no different then when he set off. He beat the number 2 by about 20 minutes. It was 11.30 before we set off from our cool underground garage showing 20c by the time we had left town it was on 29c and this would quickly rise to 34c and finally setting the tour record at 36c. The day was cut short at 130 miles we also decided to swap the Grosglokner pass for the Felbetauer tunnel and a slight diversion made into Mayrhofen, this would use up our free day and leave a nice run into Garnisch the following day. It was still 5.30pm before we finally removed the burning bucket from our heads for the last time. It must be tiring as Neil has just keeled over in the chair fast asleep at 6pm, must be having a power nap !! Garnisch in the rain, 5pm and we had finished for the day, just as well this was bad. An easy day having split the original into two, so here we are in hotel for 2pm only to find the room unmade from previous. What else to do but take refuge in the bar till it's sorted. The day was started with an hour walk about in Mayrhofen sadly being a Sunday all the shops were closed and the gift shopping was put on hold and the town was over run with walkers heading for the cables cars to get a start in the mountains. A lovely spot and plenty of reasons to return. Including the many pints of weissbeer the night before. I must have known the day would be easy. The ride out was on good roads and faster than previous, will still many good views on route to the German boarder followed by a ride through a national park and into Garnisch for our last proper night, after this it will become a slog on the Autobahn to complete the last 600 miles to the ferry. Well back to normal temperatures and just as well as we had 330 or more mile to do today. It was one of those days dry wet dry wet, over suits on over suits off. 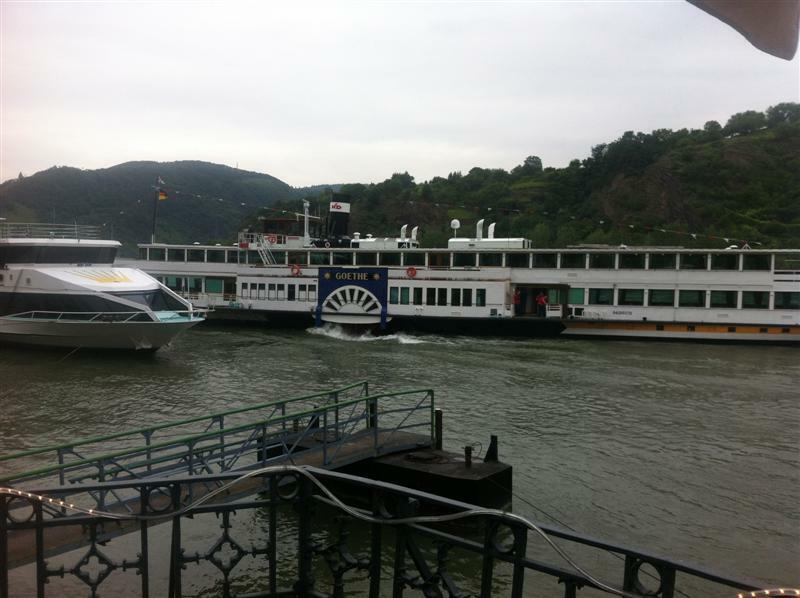 Plenty of road works on route and from a 8.30am we docked on Boppard at just after 4pm. A 9.15 start to hit the ferry , I wanted to leave at 10 so I could catch the jewelers open for a gift for my wife . However Neil insisted we left early so we could spend 2 hours in a McDonalds later in the day waiting for the ferry. Oh well excellent run in the dry and the GPS decided to route us a totally different way that previous years, so used to the McDonalds in Venlo. 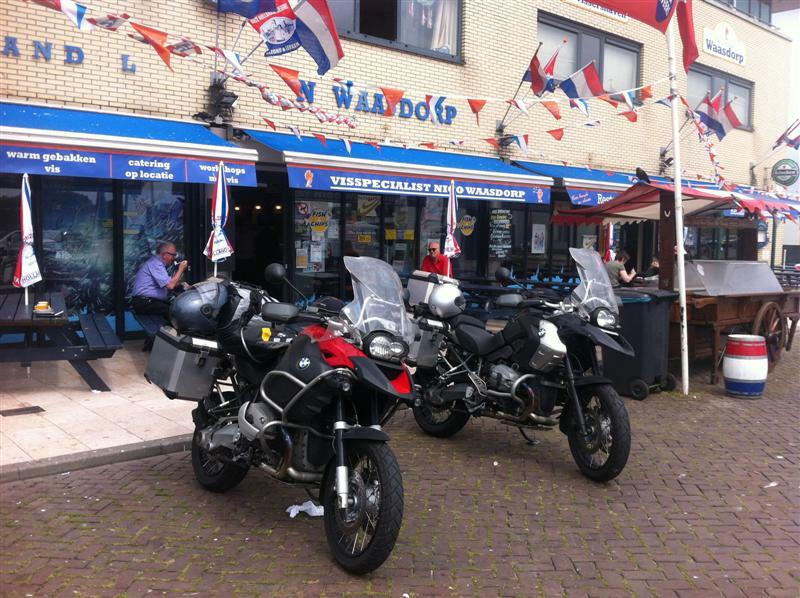 Arrived in Ijmuiden just past 2pm plenty of time for the final fish and chips before diet proper starts tomorrow.